Tax Day has come and gone once again. As a taxpayer, we’re willing to bet that you hate putting together documentation for Uncle Sam. Obviously, though, it’s something every taxpayer must do. We thought it would be beneficial to focus on 1099 preparation in our latest blog post. More specifically, what should the average joe know when they go to file 1099 forms next year? There are countless varieties of 1099 – The accompanying infographic explains this in greater detail, but it’s also worth touching on in this list. There’s a 1099-DIV for dividends, a 1099-INT for interest, a 1099-R for pensions and retirement payouts, a 1099-S for real estate transactions, and more. Interestingly, the one that’s most common (Form 1099-MISC) seems to be the most challenging for taxpayers. The takeaway here is that not all 1099 forms are the same. Timing is important – Taxpayers had until January 31, 2018 to file 1099s for the 2017 tax year. For future reference, some businesses send out their 1099s at the same time they mail pay stubs so they don’t have to send a form later. That’s why it’s a good idea to always look out for 1099s. Maybe you’re wondering, “What if I don’t receive a copy of my 1099 form by February or March.” Well, don’t just assume you’re in the clear. Believe it or not, some businesses don’t issue 1099s until well into April or May. This is certainly something to keep in mind if you’re accustomed to filing taxes early. The Internal Revenue Service receives them also – The majority of businesses send 1099s to the IRS at the same time they mail forms to taxpayers. It’s just easier that way, right? Other payers get the necessary documentation to employees, allow some time to collect copies, and then transmit this information electronically to the IRS. Why is this worth mentioning? Here’s the thing: while you may think you can hide earnings information from big brother, you really can’t. Report errors as soon as possible – It’s one thing to keep every 1099 in a neatly organized pile. That said, do yourself a favor and open these forms immediately after receiving them. Reporting errors happen every once in a while. The last thing you want is to see $10,000 on an issued 1099-MISC when you know you only made $1,000 from the company that sent the form. Tell the company immediately if this occurs. Report every 1099 – It goes without saying that you can’t ignore a 1099 form. Keep in mind that the IRS matches every single 1099 form with your tax return. Do you think a particular one should be canceled? Then make it a point to explain why on your return. Handling 1099 documentation can be more of a hassle than anything else. That’s why more taxpayers are choosing OnlineFileTaxes.com. 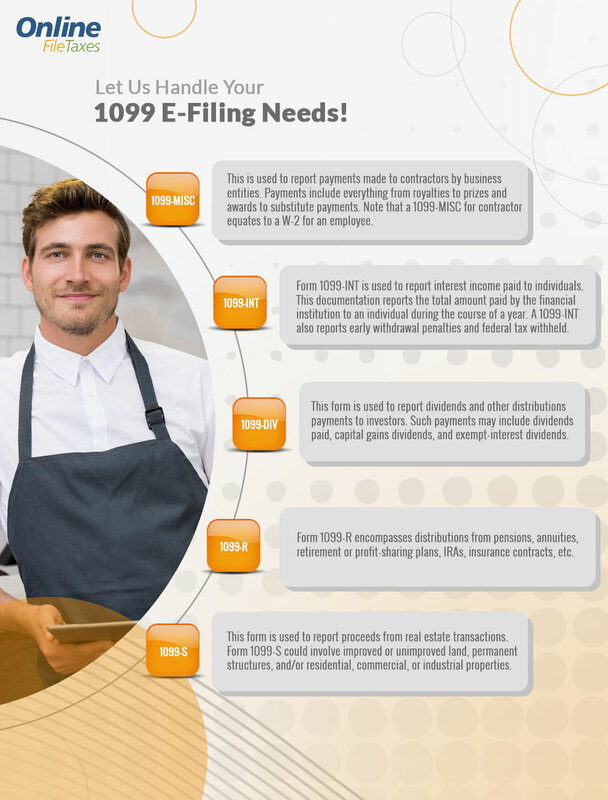 We are proud to offer the most cost-effective way to efile 1099 forms. With OnlineFileTaxes.com, you can process hundreds of forms in a way that’s seamless and economical. Our system is ideal for businesses, CPAs, accounting professionals, and individuals alike.